Welcome to Winfield and the Lakes of the Four Seasons! Winfield is a bustling Indiana community only 35 minutes away from the Indiana/Illinois border, with the distinct advantage of its immediate proximity to nearby Crown Point. Lakes of the Four Seasons is Winfield’s neighboring community that is nestled halfway between Crown Point and Valparaiso. Contact the realtors at Jana Caudill Team for a showing of homes in Winfield and the Lakes of the Four Seasons. The Doubletree Shopping Center is a favorite destination for consumers and includes a 45,000 square foot supermarket. With 19 parks, a seasonal ice skating rink, a skate park, and municipal swimming pool, there are plenty of parks and resources to stay active and outdoors in the Winfield/Crown Point area. Lakes of the Four Seasons is a private, gated neighborhood located between Crown Point and Valparaiso. This community has an 18 hole golf course, clubhouse with swimming pool and four serene lakes. The nearby Lemon Lake Park features 403 acres of hills and wooded areas. Picnic and barbecue areas, hiking and jogging trails and hayrides in autumn are just a few of the activities families can enjoy here. Other parks across Lake County offer cross-country ski trails, maple syrup making classes and other seasonal activities. Crown Point also hosts a popular St. Patrick’s Day Parade and 4th of July Parade. Lake County’s Fairgrounds, located in the southern area of Crown Point, features walking paths and the area’s only covered bridge. The Lake County Fair is the 2nd largest fair in the state of Indiana. According to City-Data.com the median household income for Winfield homes from a 2016 study shows an income of $98,674 compared to $52,314 for all of Indiana. 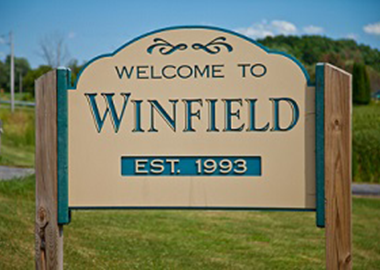 Median home values for Winfield in the same time frame were $287,710 compared to $134,800 for the rest of the state. For current, up to date information on housing in Winfield visit these listings or contact a member of our team to set up an appointment. The Winfield branch of the Crown Point Community Library is located at 10645 Randolph in Crown Point. Colleges and Universities near Winfield include Ivy Tech Community College-Northwest and Indiana University-Northwest in Gary, Indiana, Valparaiso University in Valparaiso, Indiana, Purdue University Northwest in Hammond, Indiana, Prairie State College in Chicago Heights, Illinois, South Suburban College in South Holland, Illinois, and Purdue University-North Central Campus in Westville, Indiana. Hospitals and medical centers near Winfield include Franciscan Health Crown Point, the Chicagoland Christian Village Nursing Home in Crown Point, Pinnacle Hospital, also in Crown Point, and B and B Interim Healthcare Services Inc., in Merrillville. Amtrak’s nearest station is 15 miles away in Dyer, Indiana, on Sheffield Rd.